America’s Workshop, in today’s post. Marching involuntarily down Borden Avenue in LIC recently, one decided to head east on Review Avenue towards Calvary Cemetery. 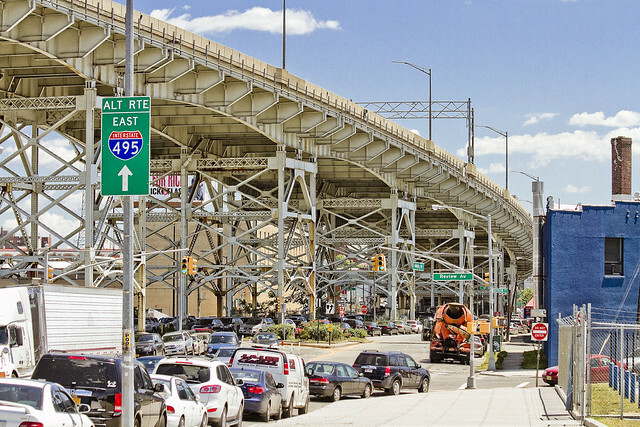 Along the way, the striking architecture of the Queens Midtown Expressway section of the larger Long Island Expressway caught my attention. This section of Borden Avenue rose out of a swamp shortly after the Civil War, originally manifesting as a courdoroy or plank toll road for horse and ox carts. Its purpose was to connect Hunters Point with upland farms in Maspeth (Borden… as in dairy) “back in the day.” This is the sort of thing you’ll hear about if you come on tomorrow’s “13 Steps around Dutch Kills” tour, btw, with ticketing links found at the bottom of the post. At any rate, one elected to head in a generally easterly direction, leaving the great steel expressway which was installed over Borden Avenue in 1939 by the House of Moses behind. Part of the old General Electric Vehicle complex was demolished a couple of years back, and as is the case with many of the “development” properties in this section of LIC, the lot sat dormant for a while. Construction has started up on the property, which I believe is going to host yet another self storage facility. 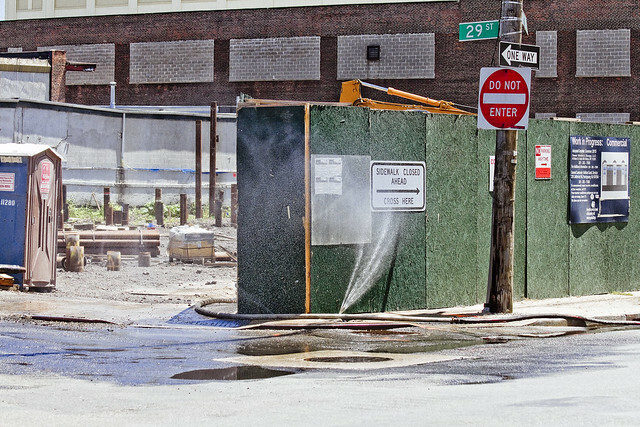 One could not help notice the hookup to a fire hydrant which the construction guys on the lot had set up, as it was geysering a spray of water into the afternoon sun. The good news is that this is a part of town which could really use a good wash, or at least a nice rinse. 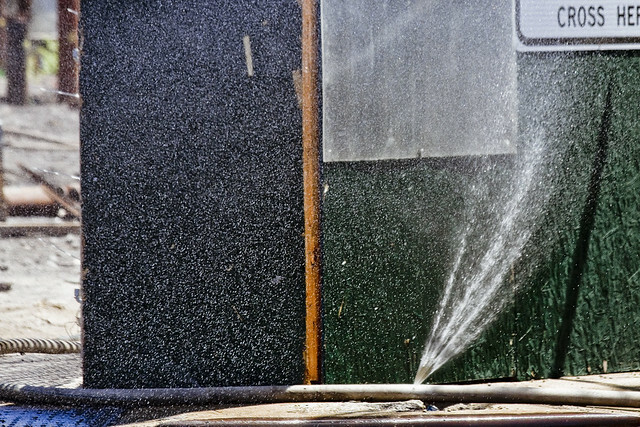 The bad news is that the water in this hose was under serious pressure – fire fighting pressure, as it were – and an uncountable amount of water was escaping from the hydrant system. This, no doubt, reduced the amount of water available for… y’know… fire fighting. 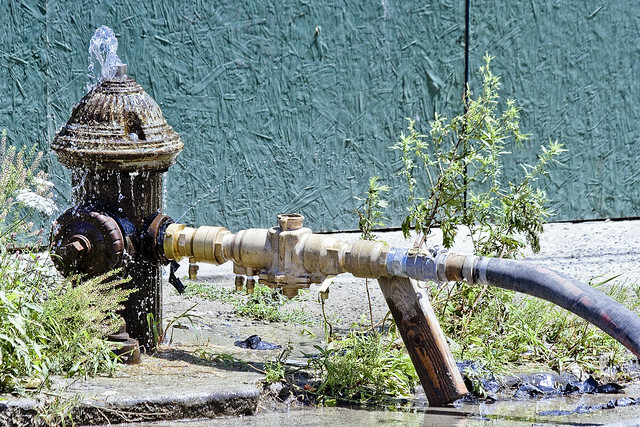 The hydrant itself was burbling and gushing as it fed the construction hookup, feeding a small but growing pond on Review Avenue. Sensing the presence of humans moving around behind me, one noticed that the geyser of water was serving another purpose on this warm afternoon in LIC. The pause that refreshes, indeed. So, whatcha doing tomorrow morning? Want to come along on the walking tour I’m conducting with Atlas Obscura of the Dutch Kills tributary of the fabled Newtown Creek? The weather should be perfect, btw, and quite similar to today. Ticketing link is just below. 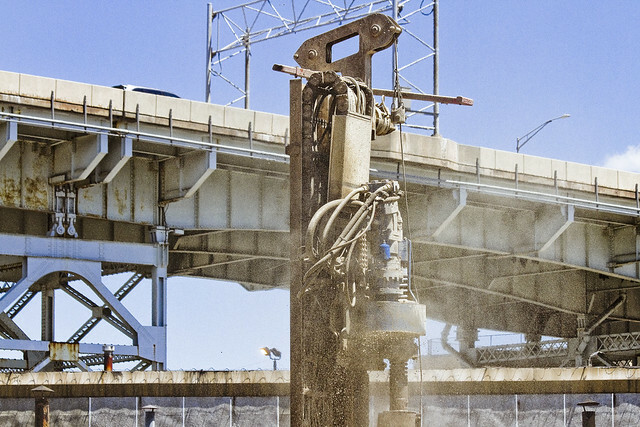 That is a pile driver, sending metal beams deep into the muck. It’s much needed when putting large buildings on top of former swamps.